Industry focuses on improved safeguards for radiation therapy equipment and scanners and thorough training to better control patient radiation exposure. The public and the imaging industry have been growing increasingly concerned about radiation exposure from diagnostic imaging, particularly CT, and from errors during radiation therapy. The issue seemed to accelerate earlier this year when The New York Times published a lengthy article about two cancer patients who died as a result of radiation overdoses while undergoing treatment with linear accelerators. Medical imaging equipment and therapeutic technology manufacturers say they have always been concerned about patient safety—long before the recent headlines—and that while they’re always willing to do more, they have been taking steps all along to reduce patient exposure to excessive radiation doses and curtail medical errors. 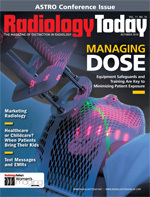 Over the last 20 years, Dave Fisher, executive director of the Medical Imaging & Technology Alliance (MITA), an association representing the manufacturers, innovators, and developers of radiation and medical imaging therapy, says manufacturers have sought improvements to the technology that have reduced dose on the diagnostic side and helped better focus dose on the therapeutic side. “In some cases, with the new technologies, dose levels have dropped by as much as 50% to 90%,” he says. Companies also are working diligently to ensure the technologists who operate their equipment are able to reduce dose and prevent even the smallest number of errors, according to Fisher. Earlier this year, Fisher says MITA members, which include big names such as Philips, GE Healthcare, Siemens, and Toshiba as well as other manufacturers, agreed to two initiatives, one designed to address patient safety in medical imaging and one designed to address patient safety when using therapeutic equipment. MITA’s first dose-check initiative, announced in March, involves installing software on all new CT machines to alert their operators when recommended radiation dose levels, as determined by a hospital or an imaging center, will be exceeded. “The alert is designed to provide a clear indication to the healthcare providers when radiation dose adjustments made for a patient’s exam would result in delivering a dose higher than the facility’s predetermined threshold for routine use,” Fisher says. A second feature includes an alarm that would stop the scan if it would result in harm—if the patient would be burned by the radiation, suffer hair loss, or develop cataracts. “The institution can configure the settings so that if the dose would be too dangerous, it can stop the procedure from moving forward,” Fisher says. While some systems already have these safeguards, manufacturers have promised to include them on all new releases of their CT products by the end of next year, Fisher says. Manufacturers also plan to install them on compatible CT systems that are already in use and could have them installed by the end of the year, he says. “Each company is working on its own timeline and is working with the Food and Drug Administration to do it,” he explains. A third prong of MITA’s dose-check initiative involves developing radiation dose reference values to provide a data point to compare the dose level of a specific procedure. “There are studies that show there are variations in dose levels across the country, and there are a lot of reasons for that,” Fisher says. “But there is no reason why we can’t establish local, regional, or national levels of appropriate radiation dose for specific procedures once we have enough information to do that. Some institutions have a higher priority on dose reduction than others. Whenever you see variation, there is room to bring it down.” MITA is committed to working with other stakeholders to develop the most appropriate way to incorporate this information into manufacturers’ technology, according to Fisher. • expanding and standardizing the reporting of medical errors associated with radiation across stakeholders in a manner that is transparent for patients, families, and physicians. In June, MITA announced its Radiation Therapy Readiness Check Initiative to address protection features for radiation therapy equipment. The initiative involves adding three checkpoints to help ensure proper treatment for every patient. The first is a radiation therapy pretreatment quality assurance (QA) verification and approval that would block treatment from proceeding if QA approval for the initial or modified treatment plan had not occurred. The second is the verification of beam-modifying accessories that would block treatment from proceeding if their proper placement had not been verified. The third is a patient-positioning confirmation that would require the operator to compare an image of the patient in the correct treatment position with the actual patient at the time of treatment. Fisher says manufacturers have agreed to implement these initiatives as soon as possible and make them available within two years on compatibly configured products that are already installed. He is convinced the two initiatives will go a long way in helping reduce dose and medical errors that can be harmful to patients. CT equipment manufacturers say they are not only implementing the MITA initiatives, but they also are working on their own to improve radiation safety. Christian Eusemann, director of clinical research and development for Siemens Healthcare’s CT division in Malvern, Pa., says the company has been addressing the issue of dose safety internally as well as externally through MITA. “We have always been proactive on this issue,” he says, long before it was making headlines. Since 2007, Eusemann says Siemens has introduced 10 major dose reduction and monitoring features for its CT machines. In 2008 the company made improvements that reduced dose for perfusion scans by 50% and in 2009 introduced additional technology to reduce dose yet again, he says. The 2009 dose-monitoring technology is similar to the MITA initiative in that a notification appears on the screen if a radiation dose is set higher than an institution’s limit. Philips referred questions about its initiatives concerning dose reduction and medical errors to MITA. Some radiation therapy equipment manufacturers say they’re ahead of the curve on this issue and have safety features built in to ensure treatment accuracy. The CyberKnife Robotic Radiosurgery System, which received FDA clearance in 1999 to treat intracranial tumors and again in 2001 to treat tumors throughout the body, has always delivered accurate and targeted radiation treatments, according to Robert Hill, vice president of engineering at Accuray in Sunnyvale, Calif., which manufactures the system. Hill says Accuray’s goal is to reduce the radiation that hits normal tissues, including the baseline level of radiation to which the patient undergoing treatment is exposed. Hill says training is critical because one of the most common causes of radiation incidents that everyone is reading about is user error. “Accuray has put in place extensive training to minimize the chance that a user error would cause a patient safety issue. Since the very beginning of our product, we’ve done a tremendous amount of training. We offer courses … in our training facility where users can get clinical and technical training. We also send folks to the site for direct hands-on training. And we send users to other hospitals that have our equipment to see how it is being used by experienced personnel. Our trainers are on site as the hospital gets up and running and they start treating patients. After the initial patient treatments, we remain available for phone support or to go on site if they have any questions,” he explains. Ken Buroker, vice president of regulatory affairs and quality for TomoTherapy in Madison, Wis., which manufactures radiation therapy equipment used to treat a variety of cancers, says his company fully supports efforts by MITA and the Advanced Medical Technology Association to develop and implement enhanced patient protection features for radiation therapy equipment. However, he says TomoTherapy already provides a number of inherent checks and balances to help ensure its users correctly and precisely deliver the intended radiation therapy to treat cancer and minimize patient risk. For example, he says all the information needed to treat a patient is stored in the equipment’s central database—the patient history, the treatment plan, and the quality assurance (QA). “So the chance of data corruption by transferring information from outside the system is greatly reduced,” he notes. Also, TomoTherapy’s system can be used daily to take a low-dose helical CT image that helps ensure the patient is positioned properly to receive the targeted treatment. “One of the difficult things with radiation therapy is getting the patient located. There’s a lot of ancillary equipment out there to help the process. With our ground-up design, by being able to take a CT image of the patient and adjust as necessary, it gives you one more step to getting the patient properly located so treatment can be delivered as expected,” Buroker says. Like the others, Varian Medical Systems of Palo Alto, Calif., has already implemented many aspects of the MITA radiation readiness dose-check initiative. “Varian’s linear accelerators—particularly the latest models like the TrueBeam system—are optimized for delivering not only conventionally fractionated radiotherapy treatments but also for highly precise radiosurgery treatments involving high doses delivered over just a few fractions. Consequently, safety considerations have been paramount in the design and development of these machines,” says Meryl Ginsberg, senior public relations manager. Varian offers comprehensive training programs in the safe and effective use of Varian technology, Ginsberg says. Varian takes a “blended learning” approach to customer training that encompasses on-site clinical support, classroom training, and remote learning options. Every year, 2,500 to 3,000 radiation oncology professionals travel to the company’s learning center in Las Vegas to take one of more than 350 courses offered, she says. In addition, Varian is working as part of a clinical council on patient safety to investigate the viability of mandatory checklists, “time-outs” or “pause points,” and other methods to improve patient safety. Time-outs are used successfully in other complex systems subject to human error, such as surgery and aviation, Ginsberg says. “Varian supports the idea of RT checklists that enforce the execution of specific QA tasks to complement existing QA procedures and help increase process compliance,” says Corey Zankowski, PhD, senior director of product management.